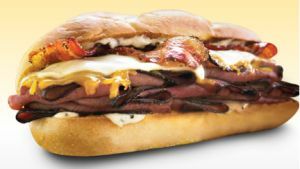 Arby’s has just introduced a new Angus beef sub, one of the inaugural menu options of their new “good mood food” slogan. It’s interesting that they’re pushing Angus as a brand (they advertise on the website that they have at least three more Angus products coming soon), since they themselves have a roast beef they’ve been pushing for years. Regardless, the Angus Three Cheese and Bacon sub is here, and let me tell you, it’s not that great. Don't make me Angus. You won't like me when I'm Angus. The main problem I have with this sandwich is the Angus roast beef. Regardless of how you feel about Angus beef, it tastes different from Arby’s regular roast beef. I personally think the regular stuff is better, but more than that I think it’s better suited to the kinds of sandwiches Arby’s makes. The other ingredients don’t fit quite as well with the flavor of the beef as they should. The combination of cheeses (swiss, cheddar, and parmesan) feels kind of arbitrary, like they picked out the three cheapest cheeses they could find. The sauce and bacon are fine, but unlike the other subs, the roll isn’t toasted (or at least the one I had wasn’t, and I’m inclined to think that’s how it’s supposed to be), which I never realized was important until it was gone. I don’t think the Angus Three Cheese and Bacon was worth the trouble. It might work with a little tweaking, but as it stands now, it’s definitely not worth the price (a little over $5 for the meal). Arby’s has plenty of good subs and sandwiches, get something else instead.